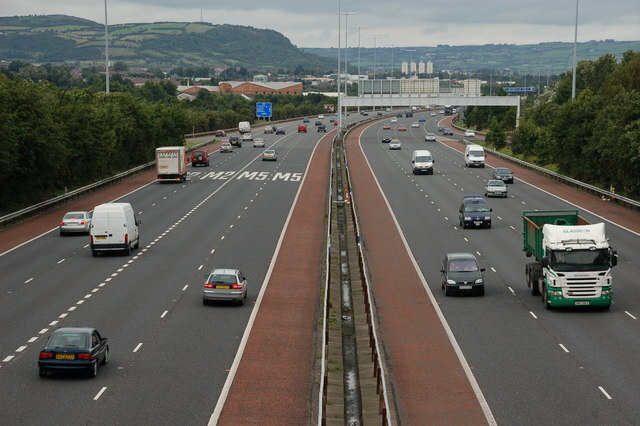 The building of the foreshore section of the M2 between Whitla Street, Belfast and Greencastle was a major civil engineering project. It involved reclamation of a large part of Belfast Lough and the transport of more than 4 million tons of fill, by rail, from Magheramorne near Larne. Work started in 1966 with the road opening in 1973. This is the view north from the overbridge at Fortwilliam. The landscaping has taken well although it is hard to hide a motorway! Those with an interest in such things will note the additional hard shoulder on the inside. This section of road carries more than 90,000 vehicles each day. Fortwilliam roundabout (Jct 1) on the M2 connects the motorway to the Shore Road and, via the Dargan Road to Belfast harbour and the surrounding commercial area. It is busy during working hours but quiet at the weekends. This page has been viewed about 623 times.